Woelfel’s stirring cocktail of supernatural suspense and goosebump-inducing horror features a superlative cast of sci-fi and horror icons including Golden Globe nominee Richard Hatch (Battlestar Galactica), in one his final film appearances. 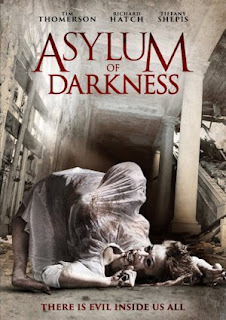 After awakening in a mental asylum, a patient plans his escape to freedom while fighting off supernatural forces in both the real world, and some that may only live inside his head. But once on the outside, he learns that the life awaiting him is more twisted and dangerous than anything he could conjur in his head, one that is luring him back to the asylum forever. Tim Thomerson (Trancers, Near Dark, Nemesis) and Tiffany Shepis (12 Monkeys, Tromeo and Juliet, Tales of Halloween) also star in the movie, a striking, spine-tingling horror jaunt, shot in 35mm, that resembles the works of genre icons Lynch and Cronenberg. Written and directed by Jay Woelfel (Season of Darkness, Trancers 6), the film stars Golden Globe Winner Richard Hatch (Dr. Shaker), Tim Thomerson (Detective Kesler), Tiffany Shepis (Hope), Nick Baldasare (Dwight Stroud), Amanda Howell (Ellen), and Frank Jones Jr. (Van Gogh).